A significant piece of Antarctic exploration history, with a poignant story attached, has now found a new home at the Tasmanian Museum and Art Gallery (TMAG). 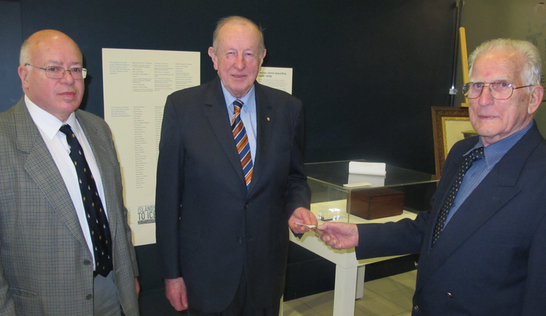 TMAG Director Bill Bleathman welcomed the acquisition of a Polar Medal awarded to Dunalley man Tasman Spaulding, who helped in the effort to rescue Captain Scott from the Antarctic in 1903-04. “Mr Spaulding served as an Able Seaman on the Terra Nova, one of the two relief ships that went down to the Antarctic to effect the rescue of Captain Scott,” Mr Bleathman said. However, TMAG Cultural Heritage Curator Elspeth Wishart said due to a cruel twist of fate, Mr Spaulding never received his medal and it has been sitting unclaimed for the past 108 years. “Due to a clerical error, Mr Spaulding’s first and last names were transposed on the medal, and it was gazetted to an S. Tasman,” Ms Wishart said. Ms Wishart thanked Herbert Dartnell, a past Australian National Antarctic Research Expedition (ANARE) expeditioner, who had worked hard to find a more appropriate home for Mr Spaulding’s medal. “Mr Dartnell has been researching this sad story, and in an effort to try and right the wrong he retrieved the medal from its custodians, the UK Polar Medal Committee,” Ms Wishart said. Pictured: Mr Herbet Dartnell, Sir Guy Green and Mr Jim Spaulding.